'It's the soul of your home' remarks the interior decorator about the hearth in Betty's front room. But Betty really doesn't understand this concept because she's never really at home in her own home, is she? 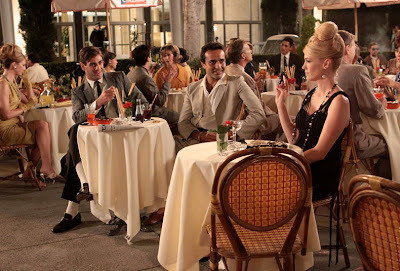 This week Mad Men takes the gloves off and all the pent up emotions flare out of our favourite characters. And whilst other shows brazenly use the flash forward device (yes, Lost I'm looking at you) Seven Twenty Three elegantly confines the flash forwards to particular climaxes within the 42 minutes of the episode. It opens with Betty lying on an ugly chaise longue, Peggy waking up with a strange man and Don lying face down on the floor of an hotel room. As the narrative spins out from this bizarre triumvirate we get a massive amount of character and plot development. The episode zips along. Sadly, there's no sign of lovely Joan. Instead, Betty initially tries to get Don to approve the new look for the front room with her interior designers. Pithily she remarks to Don, "All you do all day is evaluate objects, I would like the benefit of your eye." The empty hearth symbolises Betty's anxiety in this episode as she goes on an interesting journey and gets involved in the community's determination to save the local reservoir. Betty has a brainwave and uses her connections to bring Henry Francis from the Governor's office into the fray. If you remember, Betty had a rather electric connection to Francis at Roger's party. It's obvious Henry has the hots for Betty and the madame is playing it all coy and cool when they meet in the local coffee shop. I have to say January Jones is superb in this episode, really getting under Betty's skin, the way Betty is so lost in the domestic environment. The scene at the cafe ends with Betty looking up at the sky as a very symbolic solar eclipse is taking place. Henry catches her before she faints and they walk down the street and stop in front of an antique shop. Henry tells her that she needs a fainting couch similar to those that Victorian ladies would rest on. Cue the ugliest chaise longue in the window of the shop and which ends up slap bang in front of the Draper's hearth. Betty blocks out the entire soul of the house with her own symbol of sexual tension. No wonder her interior decorator is pissed off with her. Meanwhile, Don is being courted by Conrad Hilton. 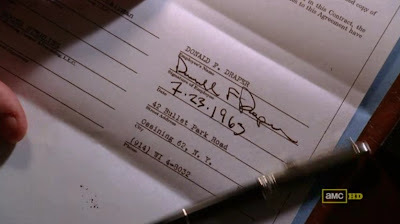 Except Hilton wants Don to have a contract with Sterling Cooper to enable any business to proceed. Don is a maverick, hates to be pinned down and this episode certainly teaches him a lesson in humility. Not only does it seem that Roger and Bert finally chain Don to the company but also Bert is particularly quite blunt about Don's options (he'll reveal his true identity if he doesn't sign) and Roger uses Betty as a way of getting at Don. The final blow for Don is his rather reckless reaction to an argument he then has with Betty about the contract and his reluctance to sign it. "No contract means I have all the power," he says. "What's the matter?" Betty asks. "You don't know where you're going to be in three years?" He flounces out of the house, clutching a drink, and drives off. He then picks up a young couple, allegedly eloping, and they offer him drugs in exchange for the ride and some fun in a motel room. Zonked out on phenobarbital, Don hallucinates seeing his father Archie who reproachfully says, "Look at you, up to your old tricks." Don then gets belted on the back of the head. I have no sympathy at all for Don and it's clear the writers are finally beginning to show that his reckless selfishness is now coming with a very hefty price tag. He isn't invincible after all. And the relationship between him and Roger is widening every episode. 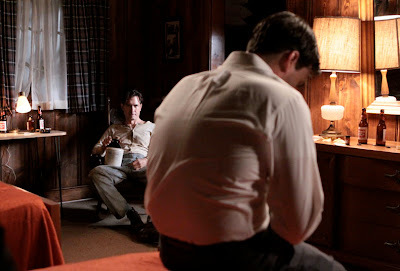 Back at Sterling Cooper, Peggy and Pete Campbell argue over gifts sent to them by Duck Phillips who is still keen to get them both over to his agency, Grey. Pete doesn't want anything to do with Duck and suggests Peggy returns the gift of the Hermes scarf. This eventually leads to Peggy personally going over to meet Duck at his hotel. Before she does this, she rather foolishly goes in to see Don in a not so subtle attempt to get work on the Conrad Hilton contract. Don absolutely lays into her in one of the most shocking scenes of the season. As usual Don has gauged Peggy right and dares to tell her to her face what we've all pretty much suspected about her for a while now: she's getting a bit big for her own shoes. "What do I have to do for you? Peggy tell me. You were my secretary and now you have an office and a job that a lot of full grown men would kill for. Every time I turn around, you got your hand in my pocket. You want a raise, you want this account. Put your nose down and pay attention to your work because there's not one thing that you've done here that I couldn't live without." If you thought that was a shocker, then nothing can prepare you for what happens in Duck's hotel room. It's clear he's after Peggy and under the pretense of a professional drink seduces her into bed. He's utterly creepy and smarmy and heaven knows what Peggy thinks this will achieve. Even she's disgusted with herself when she wakes up in the morning. The episode ends with Peggy and Don returning to work that morning. Peggy in her disheveled clothes of the day before and Don, battered from his experience with the the young couple. He signs the contract. A stunning episode, putting two major characters through the wringer and stripping away any dignity they were clinging onto. It's a searing indictment of their identities and ambitions. A complete change of pace. The episode makes a pleasant move away from the environs of Sterling Cooper and focuses on two sets of relationships; Don and Betty and Pete and Trudy. Or the absence of Trudy, which is of far more importance here. Conrad Hilton's got Don running around the place and inspecting hotels. He calls Don to arrange a trip to the Hilton in Rome as Betty carries on her campaign to save the reservoir. Betty wishes she could accompany him but reminds Don that it won't be possible with a two-month old baby in the house. The episode's theme is all about holding back the inevitable: for Don and Betty it's a chance for their relationship to momentarily flare back into life before Betty finds herself back in suburbia and trapped again in domesticity which she positively loathes. For Pete, it's the loneliness of being home alone and the temptations it offers until Trudy returns and his guilt overwhelms him. And the plan to save the reservoir is symbolic of it all. Henry Francis shows up and uses political delaying tactics to stop the redevelopment of the reservoir but by the end of the episode the reprieve is overturned. The whole trip to Rome is utterly delightful. Difficult for a show like Mad Men to realise this in a studio and without location trips abroad but they just about pull it off. What's lovely is that we get a glimpse of why Don and Betty are good together. January Jones and Jon Hamm have great chemistry and are superb in this episode. Jones is sublimely beautiful and it's breathtaking when she appears at the Hilton cafe and flirts with two Italian men and then plays games with them and Don. It's a great scene showing Don and Betty, as two beautiful people, at play, relaxed, flirtatious and confident. The moral conflicts and deep sadness at the heart of Betty and Pete is told in a very stripped down way with a great deal of short, deftly edited sequences. The episode comes across as a series of very brief montages, inching the story along. Pete, home alone, seemingly does his good deed for a neighbour's au pair who's ruined a dress belonging to her employer. The narrative hoodwinks us into thinking Pete has suddenly found his humanity and we happily go along with his intentions to get the dress exchanged for Gudrun, the au pair. When he goes to exchange the dress, he meets Joan (yes!) who has taken a job as a supervisor at the department store he's taking the dress back to. There is a strained exchange between the two, both hiding the real reasons for what they are doing. And Joan is clearly onto Pete, knowing that his story about the dress belonging to Trudy is a complete load of nonsense. Of course we should realise that Pete never does anything for anybody without him wanting something. He returns the dress and Gudrun thanks him. But he obviously goes away and twists himself in knots about it, gets drunk and then scuttles back to Gudrun to seduce her. This happens much to the anger of her employer who turns up the morning after and gives Pete a piece of his mind despite also seemingly letting him get away with it in a sort of 'we men understand each other' way. So, Pete is still the vile reptile we always thought he was. When Trudy returns and he goes into a sulk, it's hard to fathom whether he's upset about seeing the au pair with the children in the building's lift or that he's racked with guilt over cheating on Trudy. A truly repellent man. Meanwhile, Betty flowers into life whilst in Rome and it's obvious this is the life she wants to live, 24/7. The rekindled relationship between her and Don is also something Don is trying very hard to maintain but Betty just throws it back in his face once she's back in dreary suburbia. And she's also got a problem child on her hands as Sally continues to develop her psychopathic tendencies. Poor old Bobby doesn't stand a chance! There's a stunningly good scene at the end between Betty and Sally as Betty attempts, rather ineptly, to impart some motherly advice to her errant daughter about kissing boys. "You don't kiss boys, boys kiss you." Really, Betty? So that's what's turned you into an ungrateful wretch as your husband buys you expensive gold trinkets as a token of his love and you just pout and sulk because your dream has been interrupted once more by housework, kids and nosy neighbours. You could really slap her, couldn't you. 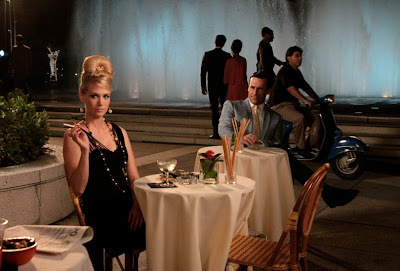 Thanks as ever to the marvelous Mad Men official site and blog.